Proper lubrication in every stamping and drawing process is vital to the	product finish and press dies. At EnviroServe Chemicals, we are able to	provide press lubricants and forming compound that are designed to deliver	optimum lubrication and corrosion prevention. Our	EnviroDraw™ and	EnviroForm™ product lines are designed to reduce die wear, eliminate draw lines and	part galling. EnviroServe Chemicals has been serving the Southeastern United States with	metal chemical products. Our experienced technical support staff can help	you address your metal stamping needs. 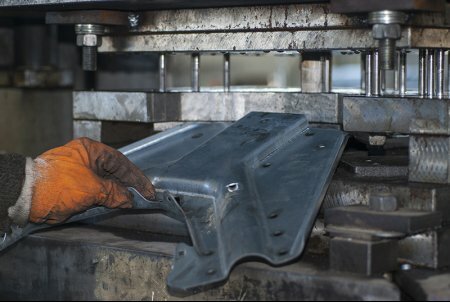 To learn more about how our team	can help you with metal forming,	give us a call at (910) 892-1791.